Site For Commercial Development For Sale in St Venera. Located in a prime location this would make as a great development site for an office block or as a retail outlet. No permits currently applied for but one can obtain permits for a 4 + 1 development in this location. The site is measuring 40feet wide facade and 75feet depth. This gives it a total of around 280sqm in squarish layout. 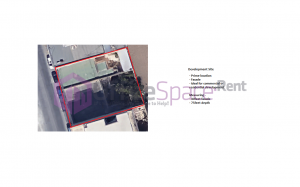 Potential for 1000sqm of offices rent-able in the area at around €135/sqm/annum. Very good return on investment commercial real estate in Malta.